On 10 December 1948, the United Nations General Assembly adopted the Universal Declaration of Human Rights, which has become a universal standard for defending and promoting human rights. Every year on 10 December, Human Rights Day marks the adoption of the Universal Declaration. On Human Rights Day it is celebrated around the globe that "All human beings are born with equal and inalienable rights and fundamental freedoms". 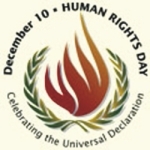 The theme of Human Rights Day 2005 is "End Torture Now!". Torture is a crime under international law. According to all relevant instruments, it is absolutely prohibited and cannot be justified under any circumstances. This prohibition forms part of customary international law, which means that it is binding on every member of the international community, regardless of whether a State has ratified international treaties in which torture is expressly prohibited. The systematic or widespread practice of torture constitutes a crime against humanity.